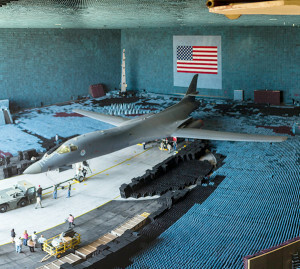 An Edwards B-1B sits on the 80-foot turntable in the Benefield Anechoic Facility July 27, 2016, after being towed inside. The chamber is filled with polyurethane and polyethylene pyramids designed to stop reflections of electromagnetic waves. The size of the pyramids, which are painted dark blue or black, varies depending on the particular frequency and test procedure being conducted. Aircraft systems can be tested and verified that they work properly prior to actual flight test. Recently, innovators working in the Benefield Anechoic Facility at Edwards Air Force Base, Calif., teamed with Air Force Life Cycle Management Center’s Electronic Warfare and Avionics Division of the Agile Combat Support Directorate to execute the Closed Loop Operational Test Vertical Testability Demonstration using the Laboratory Intelligence Validated Emulator (LIVE) here. “Closed loop” in this context means interactively receiving and transmitting. This collaboration delivered a “first-ever” installed systems ground test that demonstrated closed loop operationally representative effectiveness. 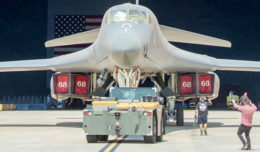 More than 64 test points from 129 test runs were collected against the B-1B Lancer AN/ALQ-161A electronic countermeasure system via two LIVE models. This innovation project enhanced the largest Department of Defense Major Range Test Facility Base capability to assess installed electronic warfare performance with more realistic emulation; implemented a proactive versus reactive test methodology; and allowed for growth to more complex engagement scenarios in a secure manner. The LIVE’s ability to generate synthetic skin returns, receive radio frequency electronic attack responses from a system under test, and internally combine and process the skin return and electronic attack response, is critical to future BAF testing. The team’s diligence was recognized as the 412th Electronic Warfare Group’s Innovation Team of the 3rd Quarter resulting in an opportunity to compete at the 412th Test Wing level. 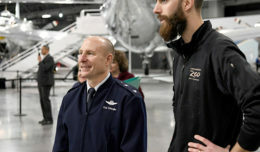 “It was exciting to be a part of a groundbreaking project that will change the way we test installed EW systems,” Zastovnik said.